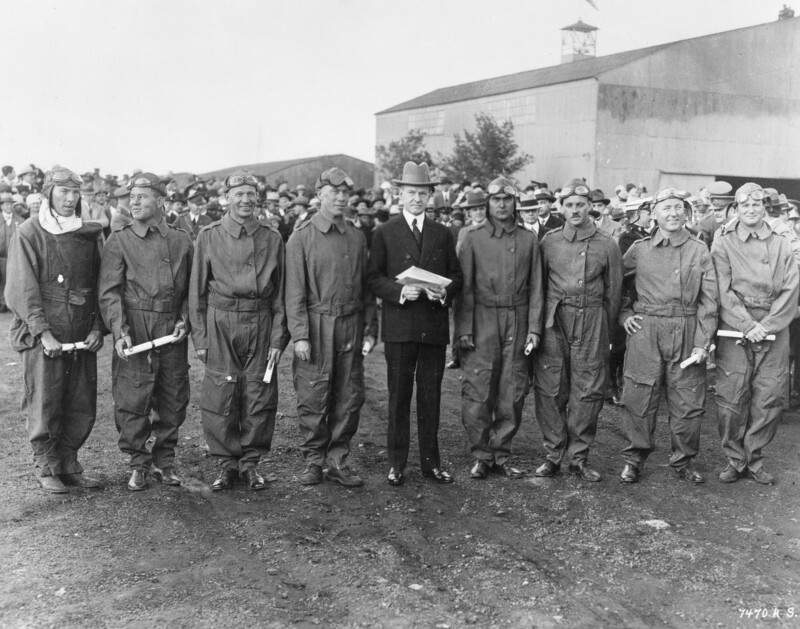 President Calvin Coolidge presents Distinguished Flying Cross citations to the Pan American Fliers on May 2, 1927. The first to circumnavigate South America by air, they were (left to right): 1st Lt. Charles Robinson, Capt. Arthur McDaniel, 1st Lt. Ennis Whitehead, Maj. Herbert Dargue, President Coolidge, Capt. Ira Eaker, 1st Lt. Muir Fairchild, 1st Lt. Bernard Thompson and 1st Lt. Leonard Weddington. They received the actual medals later. Herbert Arthur “Bert” Dargue was born in Brooklyn, New York, on Nov. 17, 1886. After high school he worked briefly as an educator before deciding to become a soldier. He entered the U.S. Military Academy in 1907 and graduated in 1911. After a short tour in the U.S. he was posted to the Philippines. While there, he volunteered for service with the Aviation Section of the Signal Corps. In July of 1913, he completed flight training and received his wings. On Dec. 16, 1914, Dargue (as pilot) and Lt. J.O. Mauborgne (as wireless operator) became the first Army airmen to transmit and receive radio messages while in flight. Soon after, he was transferred to the Signal Corps Aviation School at North Island in San Diego where he reported for aircraft testing and instruction duty in March 1915. He remained there until his transfer in December to the 1st Aero Squadron in San Antonio. The primary mission of the 1st Aero Squadron was surveillance, from their Curtiss JN-2 Jennys, of the U.S.-Mexico border for smugglers, armed incursions and other violations. In 1916, the squadron was detailed to Brig. Gen. John “Black Jack” Pershing’s command to furnish air support and reconnaissance for the expedition to pursue Pancho Villa into Mexico. Dargue was the first Army pilot to make an operational flight across the border during this campaign. In early April, 1916, Dargue was fired upon at Chihuahua City, Mexico, where he landed with dispatches for the U.S. Consul. On another occasion, also in Chihuahua City, Dargue barely escaped an angry mob that surrounded him and tried to destroy his plane. On April 15, he set a flight distance record on a long-range reconnaissance mission of 415 miles with only two stops. 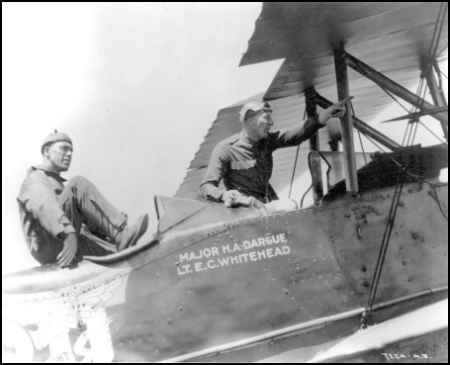 Later, Dargue returned to the Signal Corps Aviation School at San Diego. Here, in July 1917, he and another pilot made the first planned Army night flight and landing. In September of that year, he helped establish, and later commanded, the School for Aerial Observation at Fort Sill, Oklahoma. Dargue went to France in August 1918 as inspector and observer of U.S. air training and combat units. In the early 1920s, Dargue became an associate of Billy Mitchell and tried to persuade him that he would accomplish more for American aviation by working within the establishment than against it. 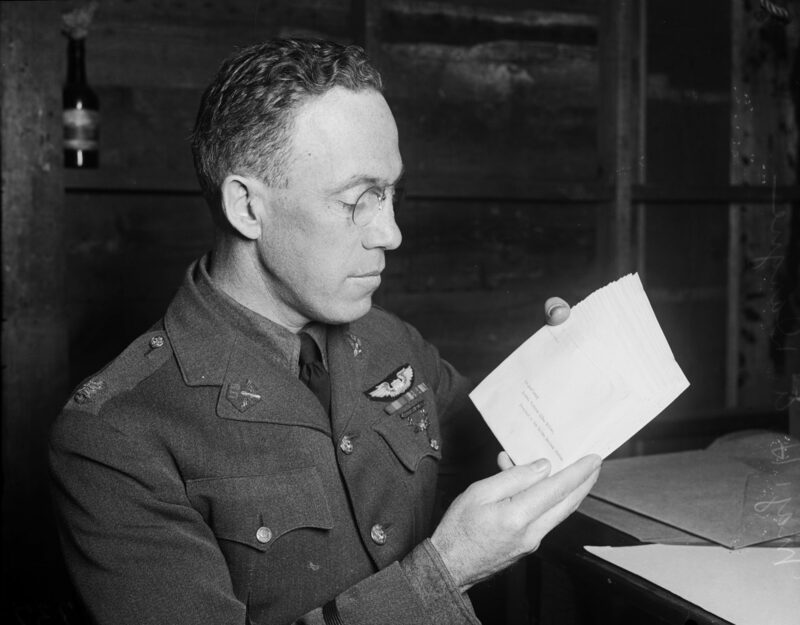 Dargue and Hap Arnold were strong proponents of a separate Air Force, coordinated with and coequal to both the Army and Navy. Dargue experienced a close brush with death in a mid-air collision over Buenos Aires which took the lives of the two pilots of the Detroit and demolished the New York. 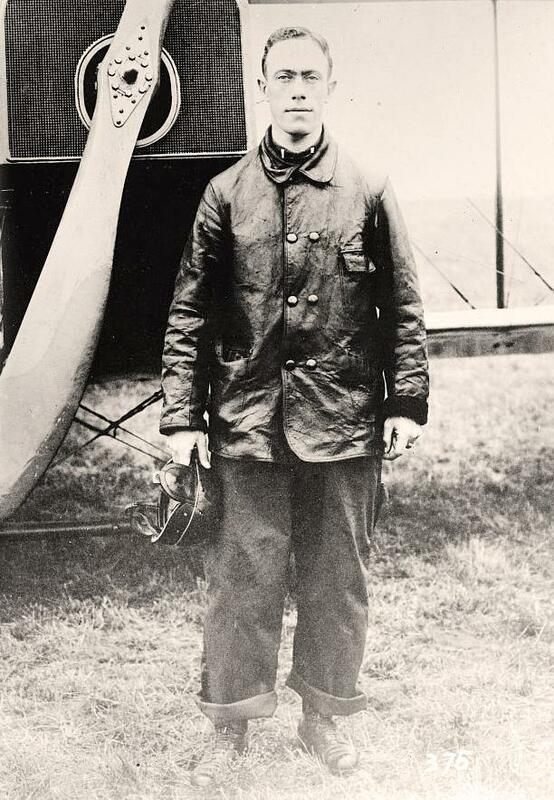 Dargue and the other pilots completed the mission and returned to Washington, D.C., on May 2, 1927. There, President Coolidge awarded Dargue and the other members of the Pan-American flight the first Distinguished Flying Crosses. Only one aircraft survives of the five, the “San Francisco,” which currently resides at the National Museum of the U.S. Air Force at Wright-Patterson AFB, Ohio. Lt. Herbert Dargue poses in front of his Jenny. Dargue spent the waning years of the 1920s continuing his military education, graduating from both the Navy and Army War Colleges. In 1930, he was assigned as commanding officer of the 2nd Bombardment Group at Langley Field, Virginia, where he served until 1934. When he flew as group commander at Langley, he chose the top rear gunner’s cockpit in one of the group’s Keystone Bombers as his command position where he could control the group’s formations by hand signals from an open cockpit. In 1934, he became assistant commandant of the Air Corps Tactical School at Maxwell Field, Alabama. While there, he worked closely with the Norden Company, helping to develop and test what would become the Norden Bombsight. In 1938, he was assigned to the 19th Wing at Albrook Field, Canal Zone. While there, he was promoted to brigadier general. The 19th included several bomber squadrons which Dargue led on a number of goodwill flights in Central and South America. In the latter part of 1941, Dargue, by then a Major-General, took command of the 1st Air Force at Mitchel Field. Upon assuming this post, he placed all bombardment and pursuit units under his command on a 24-hour full combat alert. A few weeks later, Pearl Harbor was attacked. Dargue was chosen by Secretary of War Henry L. Stimson to proceed to Hawaii to head up an investigation of the lack of preparedness at Pearl Harbor and to take command of Army units there. En route, the B-18 Dargue was piloting crashed in the Sierra Nevada mountains near Bishop, California, killing all aboard on Dec. 12, 1941. Portrait of Herbert Dargue autographed to his close friend, Lt. E. S. Hoag. Dargue’s Mackay Trophy (above) was presented to the Daedalians at a meeting of the Atomic Flight at the Kirtland AFB Officers Club on Dec. 17, 1993, by his daughter-in-law, Elaine Green Dargue, the widow of Hereditary Member Donald S. Dargue. This fulfilled the provisions of Donald’s will, who had inherited the priceless artifact from his father. Atop the brass base sits a finely detailed eagle with wings spread in flight. Resting atop the wings of the eagle is a large globe of the world with all the continents and major islands finely detailed. The route of flight is further raised above the surface of the globe and each stop of the flight is engraved. The trophy is crowned by a detailed model of the Loening COA-1 – even the three-bladed brass propeller turns. On Dec. 16, 1914, Dargue (as pilot) and Lt. J.O. Mauborgne (as wireless operator) became the first Army airmen to transmit and receive radio messages while in flight. 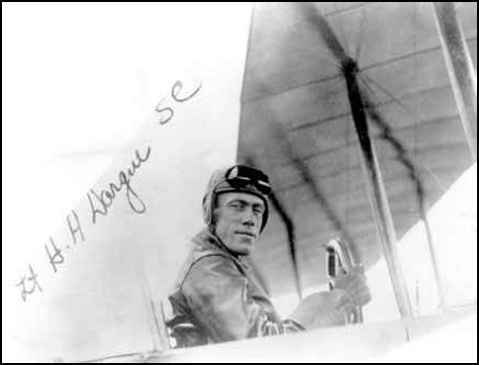 In 1916, Dargue was the first Army pilot to make an operational flight across the border (from Columbus, New Mexico) during the campaign to pursue and capture Pancho Villa. In July 1917 at the Signal Corps Aviation School at San Diego, he and another pilot made the first planned Army night flight and landing. 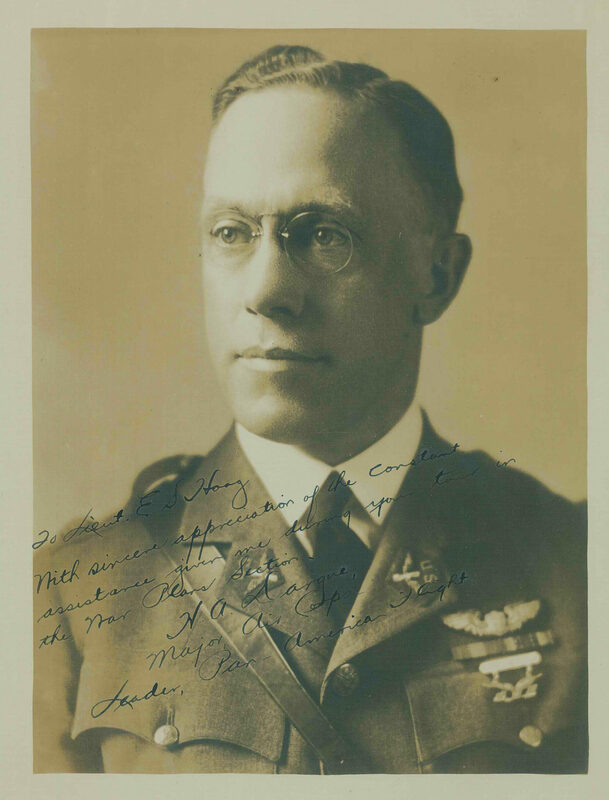 In September 1917, he helped establish, and later commanded, the School for Aerial Observation at Fort Sill, Oklahoma. In 1926, Dargue was chosen to command the record-making Pan-American Good Will Flight. This entailed the first aerial circumnavigation of South America and the risk of flying almost 21,000 uncharted miles. President Coolidge awarded Dargue and the other members of the Pan-American flight the first Distinguished Flying Crosses. In 1934, he became Assistant Commandant of the Air Corps Tactical School at Maxwell Field, Alabama. While there, he worked closely with the Norden Company, helping to develop and test what would become the Norden Bombsight. This entry was posted in AVIATION NEWS on April 23, 2018 by FASFRIC.